Lucrezia Borgia was the inaugural production at the 2007 Bergamo Music Festival, which used to be called the Festival Donizetti. Like the production of Roberto Devereux the previous year see review, it has made it onto DVD, under the Naxos label, courtesy of a licence from the Italian company Dynamic. WE get a brief essay on Donizetti’s life and a track-related synopsis each given only in English. The dual-layered disc has a very generous number of tracks, each with listed timings and details of the characters involved. Lucrezia Borgia opened the Carnival Season at La Scala on 26 December 1833. The libretto by Romani, the foremost librettist of the day, was based the plot of Victor Hugo’s Lucrèce Borgia. The play had been premiered in Paris earlier in the year where it had proved a great success. It was an obvious basis for an opera. In Milan Donizetti’s opera found favour with audiences, if less so with critics, and was soon being produced elsewhere in Italy and abroad. The action of the story takes place in Venice and Ferrara in the early sixteenth century. Lucrezia’s interest in the youth Gennaro is misunderstood by her husband, Duke Alfonso, who suspects an affair. In reality, Gennaro is Lucrezia’s son, his identity known only to her. Alfonso orders the arrest of Gennaro on a charge of having insulted the Borgia family by defacing their family crest on the wall of the palace. Lucrezia arranges his escape. Later, at a banquet Lucrezia poisons a number of her enemies and is devastated to find that Gennaro is among their number. Gennaro refuses the antidote because the amount is not sufficient for all his companions. He is horrified when Lucrezia confesses she is his mother. Gennaro dies and the distraught Lucrezia follows suit. This new production, in the revision by Roger Parker from manuscript sources, was in collaboration with Teatro Verdi di Sassari and Teatro Regio di Torino where it seemed to share the plague which afflicted the other 2007 Italian Opera festivals when leading scheduled singers withdrew. That Bergamo escaped this plague was perhaps due to careful casting with the formidable Dimitra Theodossiou scheduled for the eponymous role and ably supported by good but not international singers. In fact it was Theodossiou who came to the rescue when Fiorenza Cedolins pulled out in Turin. As I noted in my review of the Roberto Devereux from the 2006 Festival referred to above, whilst Theodossiou cannot claim the vocal elegance and floated pianissimos of Montserrat Caballé, and must be tired of comparisons with Callas, she brings committed acting on a par with her Greek compatriot. In her own right Theodossiou is justifiably considered the Norma de nos jours (see review) and features widely in Italy and elsewhere in the bel canto repertoire. Her virtues include a clear open tone, without Callas’s often-occluded notes, allied to good diction alongside her convincing qualities as an actress. These qualities are shown in this performance to best effect in Lucrezia’s dramatic confrontation with Don Alfonso, her husband, who has tricked her into demanding the death of Gennaro, unbeknown to him, her son. After taking him full on to the extent of reminding him that she has seen off three husbands, she ends up pleading desperately for Gennaro’s life (CHs.21-22). Her husband, still convinced they are lovers, only offers her the choice of poison or the sword for the boy. Theodossiou’s skills as a dramatic vocal actress are consummate in this scene. Her wide variety of tonal depth, colour and expression are also heard in the final moving cabaletta Era desso il figlio mio that Donizetti added for a revival at La Scala in 1840 (CH.39). In the contrasting lovely Tranquilla ei posa … Come’ e bello!…Mentre geme of the prologue, as Lucrezia arrives in Venice and espies the sleeping Gennaro, her pianissimos at the start could have been steadier (CHs.5-7). That said, the overall expressive portrayal is wholly credible. The only other female voice is that of Maffio Orsini, young companion of Gennaro. A trousers role, it is sung by the mezzo Nidia Palacios, whose zany hairstyle, over-feminine appearance, and some lack of convincing lower notes detracts from her portrayal (CHs.3 and 34). Such matters are better portrayed in the appearance, singing and acting of Roberto De Biasio as Gennaro. I recently admired his vocal prowess in Maria Stuarda from the 2007 Sferisterio Opera Festival (see review) and also as Edgardo in the 2006 Bergamo performance of Lucia di Lammermoor (see review). His willingness to sing mezza voce as well as his ardent open-toned lyric tenor singing impresses me in this arduous role. The strong dark-toned bass Enrico Giuseppe Iori sings with a good variety of colour to complement his vocal depth in both his confrontation with his wife and the setting of the plot for his revenge on Gennaro (CHs.13-15). The simple brick-faced structure of Angelo Sala’s set doubles with minimum additions for Venice and Ferrara and, like the dark costumes, are wholly realistic for the period. The bright colours of the dancers in the party scene highlight the contrast of mood (CH.31). The overall atmosphere is dark as befits the story. Director Francesco Belloto reveals the detail of the evolving story with conviction and without gimmicks. This is evident not least in the managing of the impressive chorus and the atmosphere created as the coffins are set (CHs.35-39) in the scene that so offended the censors for the original production. The darkness of the scenes is matched by the male voices in the supporting cast, all of whom sing and act with conviction. Conductor Tiziano Severini paces Donizetti’s drama and supports his singers in masterly bel canto fashion. Despite two audio recordings featuring Caballé (1966 RCA NLA) and Sutherland (1977 Decca 4214972) in the eponymous role, Lucrezia Borgia languished in near obscurity for nearly a century. Only since the 1960s has it begun to take its place among staged performances of Donizetti’s serious operas from this period in his compositional life. It is scheduled to open the 2009 Buxton Festival (see preview) and also features in the schedule of a major house in the USA for the coming season. 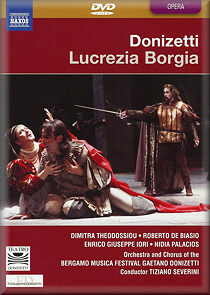 This DVD serves as an excellent introduction to the work for potential operagoers who are perhaps not wholly conversant with the composer’s powerful dramatic creations from this period between Anna Bolena (1830), his first international success, and Lucia di Lamermoor, his most melodic and famous work (1835).